Last weekend envelope users contributed 87% of our income. June 13, 2009. If you want to attend a Saturday afternoon Mass, there is a 4:00 pm Mass every Saturday at St. Peter Parish in Auburn. There is no change to the 9:30 am Mass on Sunday. News from the Group Work Camp. There will be one more meeting for the GWC on Friday, June 19th at 7:00 pm. The meeting will be held in the lower hall at St. Peter’s in Auburn. Also, the send-off Mass will be on Saturday, June 27th at the 4:00 pm Mass at St. Peter Church. Good luck to all Group Work Campers. We will keep you in our prayers. Work hard and enjoy yourselves. You are really a credit to our parish. Grades K- 3 The children in grades K – 3 attend classes during the weekend liturgies. We use a Lectionary Catechesis which is based on the Gospel of the week. Kindergarten students are not obliged to attend regularly. However beginning with grade 1, students must attend classes on a weekly basis during the Mass, as the program for 1st Communion is a two year program. The program for the school year 2009-2010 will begin on the weekend of September 19th and 20th. Classes are held during both weekend Masses. We would need some volunteers to help out as monitors during the classes. Please contact the office if you can do this. Grades 4 – 10 +, Generation of Faith This program is designed for both parents and children. Parents who have children in grades 4 - 10 are asked to attend these monthly sessions. The adult session gives them an opportunity to refresh their memory on important matters of the faith as well as giving them the chance to share with other adults on pertinent issues of faith. All GoF classes are held on Sundays from 4 – 6 pm. See you all next fall. Question for Adults: How can I be bread (nourishment) this week for someone who needs help?) All too often we forget that Jesus is not the only one who provides nourishment for others. When we receive Communion and say AMEN, we are saying that we believe that we are the Body of Christ. This means that we must be available to others when they need nourishment. There are many ways of providing this gift. It may be spiritual, emotional, or simply our physical presence. How can you do this in your daily life this week? 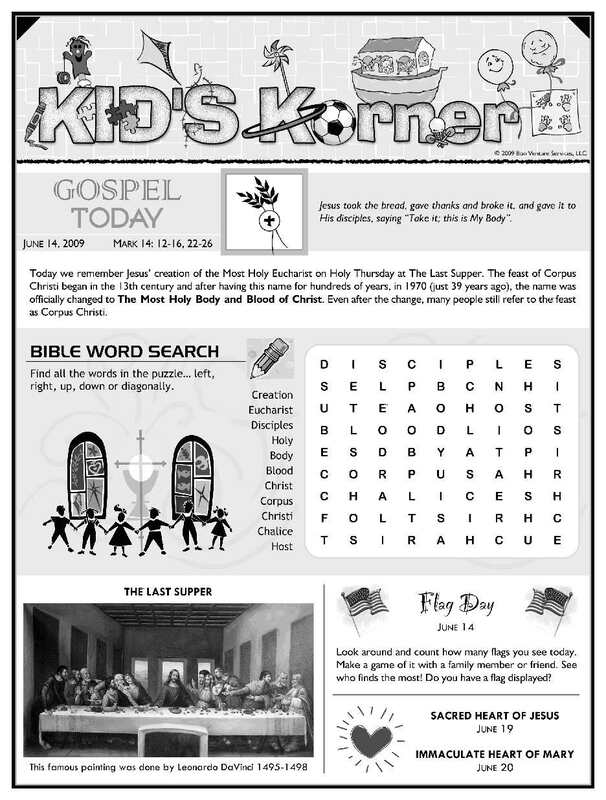 Question for Children: How can I invite others to learn about Jesus? The best way to invite others to Jesus is to be a happy presence in their lives. Children can do this easily. Others are always attracted to us if we are happy and good to them. Then, a very simple manner of invitation for children is simply direct and personal. Sometimes all someone needs is an invitation. Talk to your child about ways they can be a happy presence for others. Determines 9 year-old Rachel Wheeler invites you to join her quest to build shelter for Haiti’s destitute. After hearing a talk given by Food for the Poor’s President Robin Mahfood about the devastating effects of poverty in the Caribbean and Latin America, Rachel, Knew, despite her young age that she too could reach out to the poor. Initially, Rachel’s fundraising campaign centered on building a “baker’s dozen” of Food For the Poor homes in Haiti, but now she has decided to nearly double that and intends to build homes for 25 families. To help Rachel reach her goal to shelter poverty-stricken families in Haiti, please visit Rachel’s fundraising page, at www.foodforthepoor.org/rachel. Read more about Rachel and see CBS 4 news coverage. Know anyone who needs a home at reduced rate? Brian Van Horn who lives on the Old Deerfield Road would like to share his home with a couple or family or a single individual who may not have the means to buy or pay an exorbitant price for a rent. The home has four available bedrooms, a swimming pool, 2 baths, and sits on 5 acres of land. He is asking $800.00 a month all utilities included and pets are okay. If you or someone you know is interested, call Brian at 369-0776 or 210-1389. These are cell phones. Food Pantry for June: Please help our pantry if you can. Your generosity is always greatly appreciated. This month our pantry shelves continue to be in need of Canned Pastas, Dessert Mixes and Evaporated Milk . We always need juices. Thank you very much for all you do for God’s people. St. Anthony School located at 148 Belmont St. in Manchester has openings available for the 2009-2010 school year. New for next year the school will offer various half day Pre-kindergarten along with our full day Pre-kindergarten program. We offer comprehensive Language Arts, Math, Science, Social Studies and daily religion classes. In addition all our students from Pre-K through Sixth Grade enjoy introductory Language Instruction in Spanish, French and Chinese, Computer, Art, Library , Music and gym. We also offer Before and After School Programs. City school bus transportation is available for those who qualify. There is also bus transportation for outlying areas such as Candia, and surrounding towns. For more info visit us on the web at www.stanthonyschool-nh.com or call us at 622-0414 for a tour.